I failed in my forecast, I didn’t get 125. I got 120, OK not bad, it wasn’t a complete disaster. 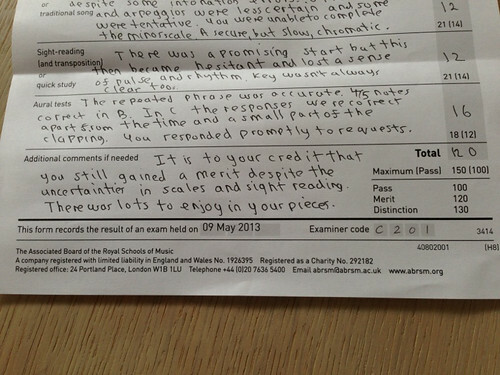 I have 80 for the 3 pieces so I think the examiner was generous, it certainly not one of my best. 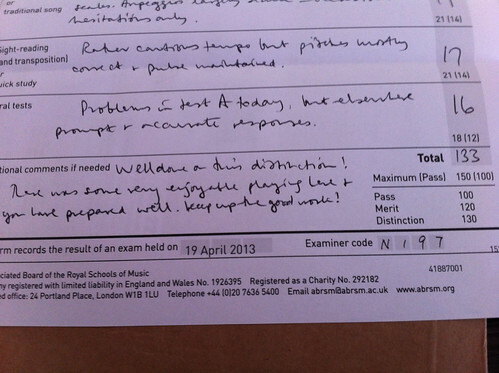 I failed in scale and sight reading, 4 marks short in total, it’s 8 marks less than last time. Aural tests as expected I got the same as in last exam, no surprises! This entry was posted on	June 25, 2013 at 9:35 pm	and is filed under Uncategorized.